It all started in 2001, when Vic & Avelynn Garcia became a a recipient of a good deed from a family friend. Back in 2001, when they were remodeling their house in Quezon City, a friend (an old woman) volunteered to house their children in Mandaluyong so they can be spared from noise and smell of paint. The couple accepted the offer and their family stayed in Mandaluyong for about a week. When the remodeling was finished, the couple asked the old lady how much they owe her, considering all the expenses incurred while they were on the house. To their surprise, the old woman told them to “pay it forward” and shared with the couple about the film. Out of curiosity, the couple watched the film and was so moved by what the character named Trevor did. In the movie, Trevor is an 11-year old child who was given an assignment by his teacher in Social Studies to think of an idea that can change the world and put it into action. In response, he created a plan where he would help three people “fix” their problems. Instead of asking for anything in return, he would tell each of them to pay it forward by helping three other people and teaching them to help three others so that a cycle of giving/helping is created. From then on, the Garcia couple practiced it themselves and even incorporated it into their training program by assigning their participants to do selfless deeds to three other persons and explaining to each of them about the movement so they themselves might be part of this cycle of helping people. Soon stories from the seminar participants began to pour in. Like there was one participant who found a 7650 celphone on a seat inside a movie house. He waited to for the owner to give him a call. When the owner finally did, the participant told him, ‘Pasalamat ka nag-Unleash na ako. Kung hindi, di mo na makikita ang celphone mo. TKPM mo na lang’ The celphone owner asked what it was about so the participant proceeded to explain the assignment and then instructed him to help three other people too. As stories came pouring in, the couple realized just how powerful this movement can be in effecting beautiful changes in our society. Taking it into a higher level, Vic and Avelynn, officially launched “Pinoy Unleashed” in January 22, 2005, at the Phil Sports Arena (also known as Ultra) in Pasig, City. It is a convention concert featuring well-known Filipino personalities who shared their inspiring life stories of success and excellence like Tony Tan Caktiong (Chairman and President, Jollibee Foods Corporation and Ernst & Young World Entrepreneur of the Year, 2004), Mike Enriquez (World-class Newscater and President, RGMA, Inc.), Dr. Rolando Hortaleza (Chairman and CEO, Splash Corporation), Cecilio Pedro (President, Lamoiyan Corporation), Jonnel Enorme (RR’s Only World-Class Special Ice Skater), Juan Benedicto “Dickoy” Magdaraog (IT Entrepreneur) and various artists/singers from Genesis Entertainment. 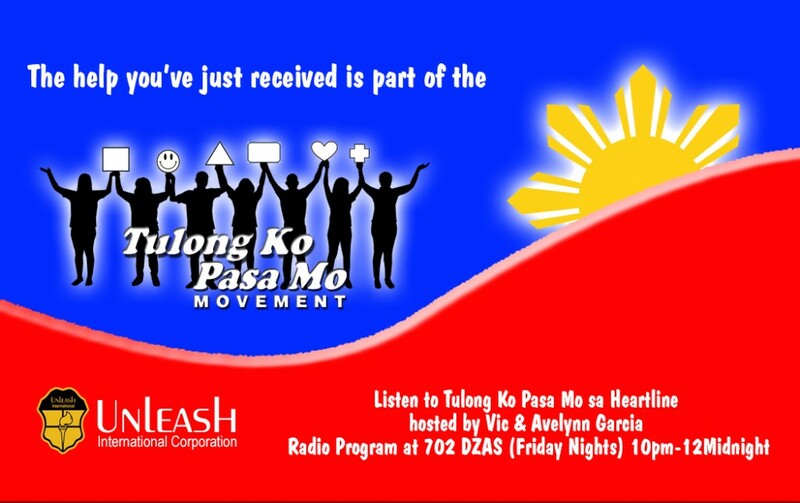 Now, nine years later, Vic and Avelynn embarked at a new journey as Tulong Ko Pasa Mo Movement found its way to the airwaves. The program present proofs that there still are Filipinos who actually do good deeds without expecting anything in return. Vic and Avelynn also conduct modules and entertain counseling live on air. With Tulong Ko Pasa Mo being a part of the lifestyle of every Filipino, Vic & Avelynn hopes to change lives one at a time. May magagawa ka! Tulong ko, pasa mo!